Having burned and scraped my way through various pots and pans and spent a pretty penny for new issues every five years or so, I have a few reasons for reverting to old ways and adopting cast iron into my cookware family. Formed by a pouring molten pig iron into casts, the technology behind the creation of this age-tested cookware is very simple. The earliest references to civilization’s use of cast iron can be traced back to fourth century BC and its debut into the kitchen scene was around the 17th century. 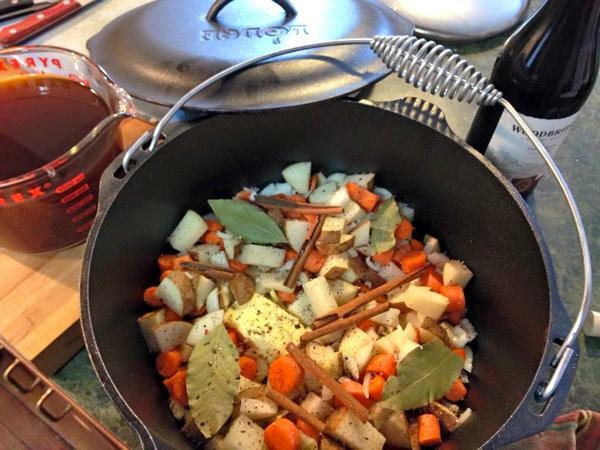 Unlike cooking with vessels lined with Teflon or other chemically derived non-stick substances, there is no danger of chemicals leaching into your food and body or the environment for that matter if you're using cast iron. As a matter of fact, one gains the benefit of added iron into their diet, which is an essential mineral that is credited with helping to carry oxygen in the body as part of hemoglobin found in blood and myoglobin found in muscles. These functions boost immune systems, help us regulate body temperatures and are credited with aiding cognitive development. In response to low iron levels, many foods are now fortified with iron and doctors prescribe iron supplements for anemic patients and growing infants. Health organizations such as The Ohio State University Extension School are now recommending the use of cast iron skillets as a means of boosting iron consumption. 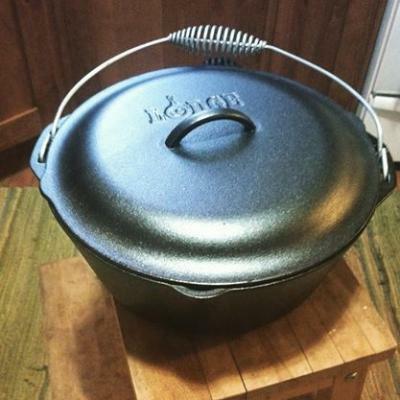 Studies have shown that cooking with cast iron can provide significant increases in your iron levels. Purchasing cast iron can be seen as an investment, given its decades-long durability. 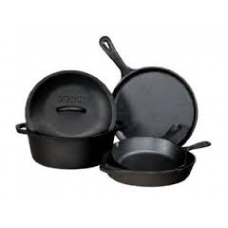 Lodge Cast Iron has provided American-made cookware since 1896, and prices are in the same range as other types of cookware like nonstick, aluminum, or copper-bottom pans. The notable difference is that a well-maintained cast iron skillet should last the rest of your cooking days and then be passed on to whomever inherits your kitchen goods once you pass on. Perusing the net, I was amused by the numerous accounts of people using their grandmother’s skillets or 100-year-old Dutch ovens purchased from antique stores. Other notables such as Alton Brown, Tyler Florence, and the many chef and foodie contributors to epicurious.com and chow.com recite the virtues of the reliability and versatility of cast iron. The iron’s ability to retain a consistent high heat, and also transfer stove top cooked food into the oven, wins praise from chefs and home cooks alike. Iron cast into skillets, loaf pans and Dutch ovens are considerably heavier than their non-iron counterparts. I do recognize that the heavy cookware can be a bit cumbersome, but it's a small price to pay and a few more calories burned before sinking your teeth into that fried chicken or peach cobbler you just made. Cast iron is famous for its “natural” non-stick coating. To maintain this non-stick or oiled pan, you do need to keep the pan seasoned with a few tried and true tricks. First, it’s suggested that you don’t ever wash your pan with soap and water. I rinse the surface of the pan with hot water and use a sturdy but non-abrasive scrub brush to remove food debris. I then place the pan on the burner to burn off any excess water left from the rinse and scrub. I keep a rag lightly soaked with oil in my pots and pan cabinet and give the pan a quick rub down with the oiled rag. Also check to make sure that the bottom of the pan is not wet to prevent rust from forming. I have grown to love the hardiness and dependability of my cast iron set. Food preparation may evolve, but the means in which we cook stays the same. I feel good knowing that one fewer carcinogen and chemical touches the food that is the sustenance of my family’s well-being. Leigh Ann Ahmad was dragged kicking and screaming to the Cities by her husband; having been born and bred in Cleveland, Ohio, she just could not fathom how colder could be better. Now, seven years and two kids later, she cannot imagine a better place to play and thrive. She’s a reformed carb-aholic, wannabe writer, social justice advocate, book-club geek, veggie grower and local foods connoisseur.